We are partnering with Casa Jimenez to reveal the best-kept secret in Carrollwood! Join our captain, Jesse Jimenez as he navigates us through some special wines, meats, and cheeses. Receive your own passport which will give you info about each selection. Once you have visited each destination, enjoy a bon voyage glass of wine from your favorite stop. Space is limited! You must be registered…no walk-ups. Through the gracious support of Hillsborough County and the City of Tampa, Community Stepping Stones sits on one of the most beautiful and historic pieces of ground in the area. What was once a 1920′s fish camp has been transformed into a dynamic center of creativity and innovation. Community Stepping Stones (CSS) extends its sphere of influence by making a make a difference for at-risk youth beyond Sulphur Spring, and throughout urban Tampa areas. 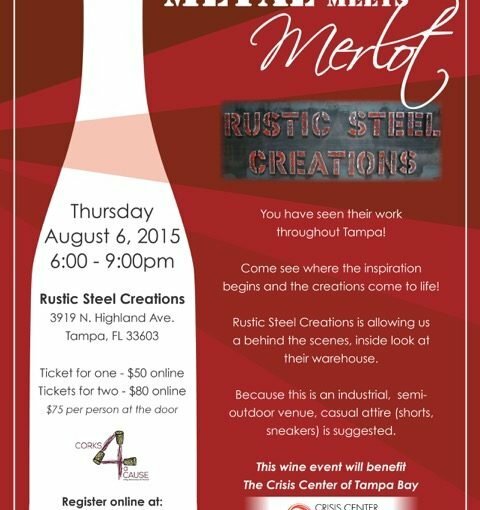 Join us this August for our wine event to benefit the Crisis Center of Tampa Bay! We’ll be at Rustic Steel Creations where we’ll see behind the scenes at how these creations come to life. Because this is an industrial, semi-outdoor venue, casual attire (shorts and sneakers) is suggested. Tickets are $50 for one or $80 for two. Posted on Categories charity, tampa, wineLeave a comment on Metal Meets Merlot!